When speccing a new PC for work or gaming, webcams don’t get nearly as much attention as they deserve. From livestreaming to job interviews to Skype calls with family members and friends, a reliable, high-quality webcam is a must-have for anyone who doesn’t want to deal with bad drivers and poor picture quality. Resolution is what webcam manufacturers love to advertise the most. Camera chips with the Full HD resolution have become extremely affordable over the past few years, especially considering bulk prices offered by OEM manufacturers, so it makes sense that we see Full HD webcams everywhere. But not all Full HD webcams are created equal. Resolution is just a small part of what determines the overall picture quality. Autofocus, white balance, image noise, focal length, and even software processing all come into play and influence whether your significant other will spend the next 20 minutes talking with a pixelated blob or the person he or she knows and loves. Since webcams don’t capture just image but also record sound, it may be worth selecting a webcam with stereo microphones with adequate noise reduction to suppress the hum (or screech) of your PC. Visit YouTube and look for sample footage. Unless you’re considering an obscure model from an unknown camera manufacturer, you should be able to find something fairly easily. More expensive webcams often come with proprietary software that allows you to apply visual effects, color filters, and do all sorts of crazy things with the footage. You may find these extras useful, but chances are that you’ll spend most of your time with the webcam using Skype, Google Hangouts, or Windows Camera. To use your webcam with these and other webcam applications, you’ll need reliable drivers. Always double-check whether the camera you’ve set your sights on is certified to work with your operating system, and don’t forget to read what other buyers have to say about it. 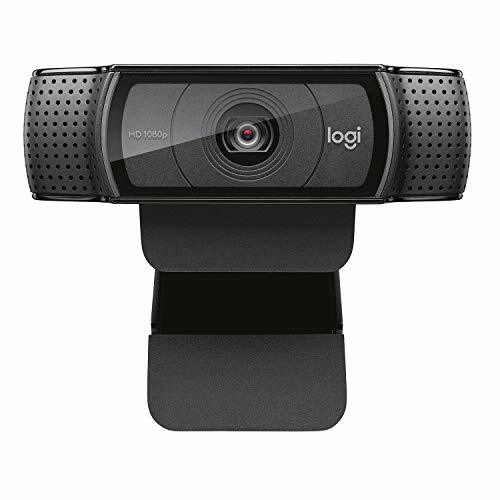 Often voted as the best webcam for YouTube, the C920 from Logitech offers fantastic image quality at a very affordable price of just around $60. Its two main competitors are the LifeCam HD-3000 from Microsoft (which is our second pick) and Logitech’s C930e. The HD-3000 lacks the crisp details of the C920, and the C930e has better image quality and a higher FOV, but it also costs almost $40 more. The Logitech C920 supports the Full HD resolution and the H.264 video compression standard, which provides good video quality at substantially lower bit rates compared to other video compression standards. While some video chat applications support only the HD resolution, the latest version of Skype can use the C920 to its full potential. 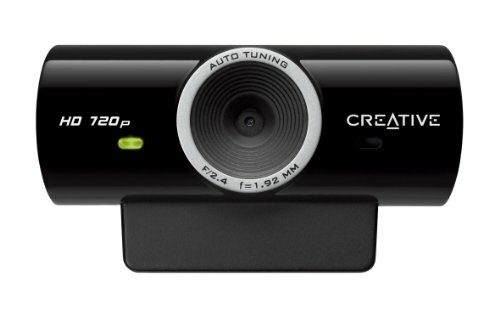 On the sides of the webcam are two high-quality microphones that capture clear stereo sound. The webcam drivers automatically filter out unwanted background noise, making your voice pop out even if you happen to live right next to a busy road. The C920 copes extremely well with low-light conditions, and Logitech’s webcam software, which requires manual installation, allows you to fine-tune the image to your liking. The Logitech C920 is compatible with all recent versions of the Windows operating system as well as Mac OS X, Chrome OS, and Android 5.0 or above. 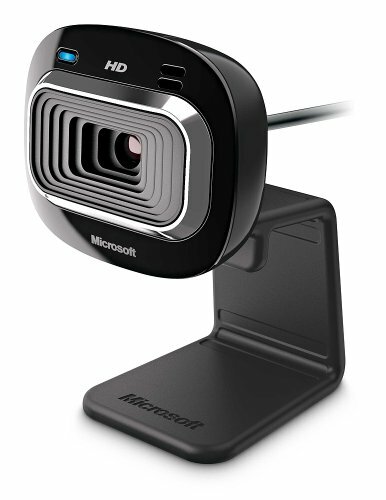 If you’re not a content creator and just want an affordable webcam for business and personal video calls, the Microsoft LifeCam HD-3000 is a wonderful choice. At less than $30, it offers great image quality and a plug-and-play setup. The webcam features a flexible plastic stand that securely fits virtually all monitors and allows the webcam to stand on its own on your desk. You can tilt the camera head in every direction to find the most flattering angle. 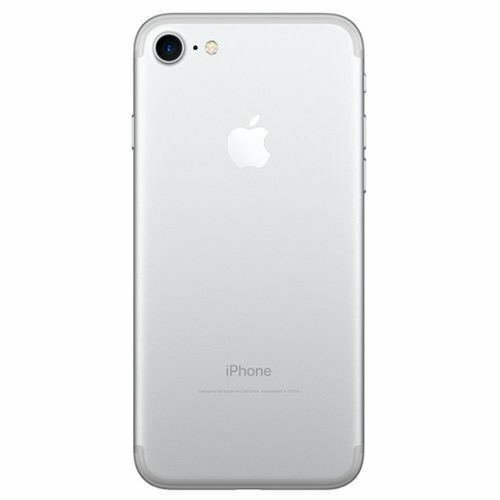 While it doesn’t support the Full HD resolution, we’ve found the image quality to be perfectly satisfactory, especially for casual video calls with friends and family. Microsoft is using something called True Color technology, which automatically adjusts how the image looks while still allowing users to make manual adjustments. A single omnidirectional microphone takes care of sound recording. Again, you wouldn’t want to use a microphone like this for YouTube, but it’s fine for video calls. The highlight of the show is how easy it is to set up the camera on Windows. All you have to do is plug it in, and your operating system will take care of the rest, including future driver updates. Because of how much it costs, the HD-3000 is often compared to the Logitech C270. Both have the same resolution and a similar microphone, but the HD-3000 is supported by more applications and records crisper video footage. 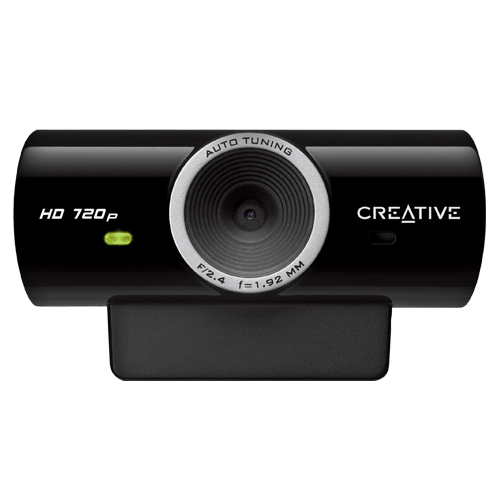 Compared to other webcams in the $20 range, the Creative Live! Cam Sync HD has a few neat tricks up its sleeve. 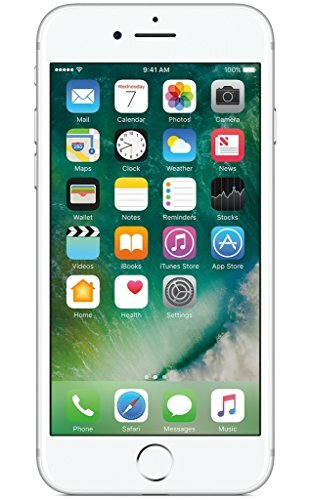 It comes with a surveillance software tool that instantly turns it from a regular webcam into a security camera for your home or office. The tool is part of Live! Central 3, which is Creative’s slightly antiquated webcam software. Despite its age, it accomplishes what it set out to do, and the same can be said about the webcam drivers. Video and audio quality is average. You can improve the image quality by manually adjusting the contrast and brightness. Some Apple users have reported that they haven’t been able to record footage in the HD resolution, but everything should work fine on Windows. The microphone automatically cancels background noise, helping others hear you loud and clear. If you know that you’re going to use your webcam only on rare occasions, we think that the Live! Cam Sync HD is a good choice, especially if you find it on sale. 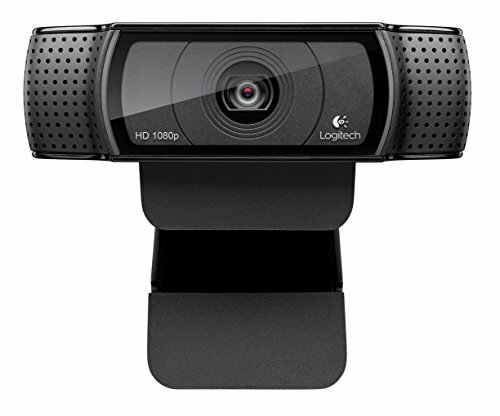 Regular webcam users would most likely soon start to crave something better, so it makes sense for them to spend extra $10 and get the LifeCam HD-3000 from Microsoft or even the C920 from Logitech. The AUSDOM 1080P is an affordable webcam with the Full HD resolution and a five-layer glass-coated lens for enhanced picture quality. It comes with an omni-directional microphone and a flexible camera stand compatible with all monitors and laptops. 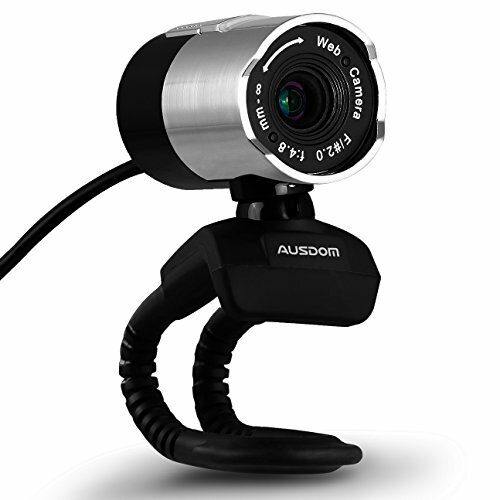 Unlike other webcams on this list, the AUSDOM allows you to manually focus the image to get the best results possible. With manual focus, you can be sure that your webcam will always be focused on what you want it to focus on—not what the webcam thinks it should focus on. The webcam is plug-and-play and supports all recent versions of the Windows operating system. Still, you can download drivers from the official website should you ever need them. Did you know that you know that you most likely already own an excellent webcam? Chances are that you have it in your pocket or on your desk right now. It takes nothing but one iOS app to turn your iPhone into a webcam. Make sure to read our article where we introduce the best camera apps for iOS. Android users aren’t entirely out of options, either. Several Android apps make it possible to transform most Android devices into IP webcams. Our favorite is called IP Webcam, but there are many others.